Life hasn't slowed down on the farm since our hectic "hay day" a couple of weeks ago. In fact, it's done just the opposite. We've come to the point in the year when our nerves, our patience, and our equipment is pushed to the limit. That's right...we're smack-dab in the middle of harvest. We started chopping corn Monday afternoon of last week on a little 2.5 acre patch near the dairy. The "warm-up" allowed us to see what equipment adjustments were needed before we moved into the creek bottom and started chopping the rest of the corn on Tuesday. We didn't get much of a run on moving day thanks to a slow start and a braking issue with our dump truck, but we successfully chopped roughly 250 tons of silage over the next two days. We should have filled our first silage bunker up on Friday, but several mechanical issues derailed us before lunchtime. 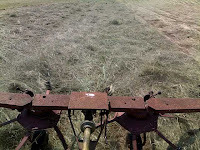 We resumed harvesting this Monday, and by late afternoon we had finally chopped enough silage to fill our first bunker. a full silage bunker or "pit"
Though there is still 9 acres of corn left to harvest, we are taking a few days off from chopping. We covered and sealed the full silage pit yesterday and cut 15 acres of sudex with the hay conditioner. We'll make baleage out of the sudex this afternoon (that is, we'll bale it at 50-60% moisture and seal each bale with plastic stretch wrap). Lessening the field work for a couple of days is also allowing us to move a few heifers and dry cows to different pastures. I expect we'll be back in the creek bottom tomorrow and should have the corn all chopped by midday on Friday. 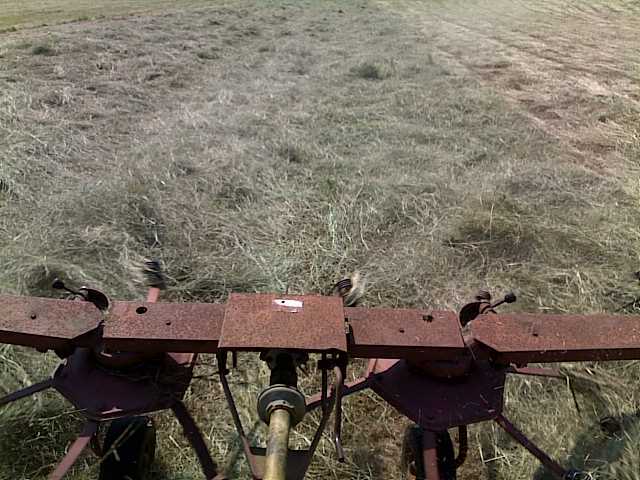 Moving forward, our tentative plan is to spend next week harvesting an additional 25 acres of sudex and applying slurry to several different hay fields. The week after that, we'll begin chopping our 90+ acres of forage sorghum. Where as the corn was planted in straight rows on flat ground, all of our sorghum fields are curvy and terraced. In other words, the sorghum harvest won't move along quite as quickly as the corn has. With feed costs seemingly rising by the day, we're fortunate that we've harvested lots of quality forage for our cows thus far. If we can avoid any adverse weather over the next few weeks, we could be looking at one of the best harvest seasons we've had in quite some time.